From early ‘till late, the all-American restaurant, café and bar is open seven days a week from breakfast and brunch to lunch, dinner and everything in between. Jackson & Rye brings a taste of the East Coast to the capital. 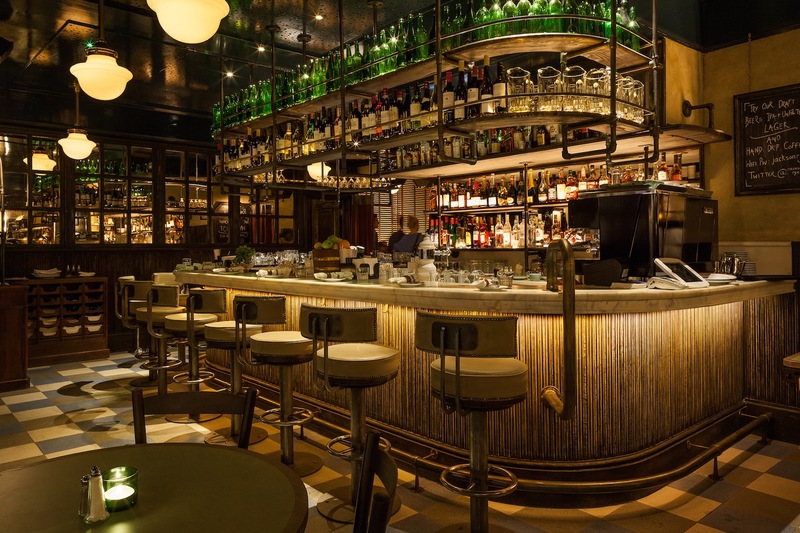 Jackson & Rye houses an impressive collection of, you’ve guessed it, rye whiskey, offering the most sought after tipples from America, Canada and Holland. I was treated to a fun master class to learn the tricks of the trade from the in-house experts Sean and Ales. Before class I was offered the Rye Manhattan cocktail, made with Rittenhouse Rye, Maraschino Cherry and Martini Rosso. It was as smooth and warming as a hot cup of cocoa, but much more decadent; we were in Soho after all. Sean and Ales sat us down and told us tales of the history of rye whisky. It has to be made with at least 51% of the rye grain and aged in American oak barrels. Following the end of prohibition in 1933, Bourbon’s popularity flourished as corn was easier to grow and it became the American whiskey of choice, pushing rye onto the backburner. Lucky for us rye is currently undergoing a resurgence and we are approaching the golden age of the ‘good stuff’. For starter I had the Grilled Shrimp & Grits. It was my first taste of grits, a creamy light textured ground-corn with hidden coarse sweetcorn. Imagine sweetcorn flavoured porridge and you won’t be far off. The fried crispy shallots and paprika spice topping livened up the dish. The Old Fashioned, usually served with Woodford Reserve, was made with High West Whiskey to pair with my heavenly main of Crispy Buttermilk Fried Chicken with Spicy Slaw and Sweet Potato. The Old Fashioned was luxurious and bursting with intense citrus, perfectly paired with a huge, juicy chicken breast with a crisp, light buttermilk crumb. This was real soul food, and I loved it. Dessert, the true highlight of the evening, was Toasted Marshmallows served with sharp Blood Orange Sorbet and rich, dark Chocolate Sauce. The Jackson & Rye team really know their rye whiskey. You are encouraged to ask for a recommendation with your meal, so don’t be shy. So often do venues try to be all things to all men and get it all wrong. Jackson & Rye does both ‘charismatic Soho cocktail bar’ and ‘seductive laid back restaurant’ – and thoroughly nails it. Grab a dim-lit booth in the restaurant to have a laid back dinner with those friends you rarely get to see. Perch on a stool at the dark paneled bar and the waiter will give you an education in rye whiskey, perfect to fill the awkward silence of a first Tinder date. Either way, for just a few hours, you will be transported to East Coast America.